Our overall mission in life is to “create a community to nourish, heal, rejuvenate wholeness by giving back people’s dignity, whilst respecting and re-connecting with Mother Earth”. We work closely with local organisations to give back to the community, including Northampton Hope Centre for the homeless providing training on cooking and budgeting enabling people to gain confidence and social skills. Our initial aim is to be a community garden and we have started off investing our own money in to creating a small holding. However we are looking at ways to involve the community as with our original plan. we would welcome your input on how to achieve this. 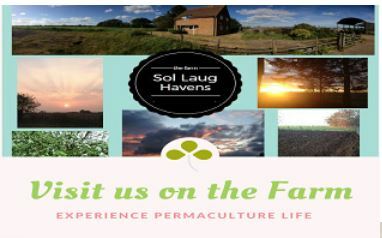 We at Sol Laug Havens create beautiful handcrafted Vegan skin care products. We nurture and grow the herbs and flowers that we use without the use of pesticides and fertilizer on our farm, based in Moulton, Northampton. Our unique soap recipes are designed by Natasha who is a Michelin trained chef who enjoys creating delightful, unexpected combinations to bring something exclusive to peoples home. We also donate 10% of all sales to the Hope Centre helping them give others a hand up to become self-sufficient. We run a monthly permaculture meetup group for anyone interested in gardening, outdoor community, anyone who is wanting to learn and share knowledge about gardening topics. There are now plans in place to develop learning resources and work experience programs. We are determined that it would be a haven of work and development opportunity for the homeless. Likewise, others with rehabilitation, disability and other support needs would be high on the agenda to work for and within the scheme. The true inspiration within this project is that it fulfils more than just a vision of future potential. By involving people who have very real needs today, it also encapsulates a genuine chance to change lives and build a community. The bigger picture is to explore, develop and create a practical environment where this exciting idea can be used to determine a better today and brighter tomorrow.